Whole30 Citrus, Cucumber and Cilantro Dip is going to become your new favourite Whole30 dip recipe. This Whole30 Citrus, Cucumber and Cilantro Dip is so easy to make and tastes amazing. 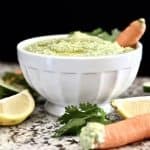 Use this Whole30 Citrus, Cucumber and Cilantro Dip as a dip for raw vegetables, or to top your favourite meat or fish dish. Is anyone else super sad that summer is over? Summer is by far my favourite season. My happiness is definitely gauged by the ability to wear sandals and Im sad to say that those days are quickly coming to an end. Winter and I are just not friends. Which is a shame considering I live in Calgary and winter is by far our longest season. Sigh. Can we talk about TV shows for a second please? I’m curious to know what you guys have been watching lately? I feel like there are so many bad shows on right now. And some that are really popular, I just don’t understand it. Like the Big Bang Theory. I honestly cannot stand that show! Do any of you watch it? If so, how??? I find it so, so annoying! To think that the actors on that show are the highest paid in television right now. Seriously? Apparently I just have different taste than the majority of people out there. But I have found a couple good shows lately on Netflix. I really liked the first season of Atypical. Has anyone else watched it? If not you need to! It’s so funny! And clever funny. Not dumb funny like the Big Bang Theory (sorry for those of you that like that show). A few other Netflix shows that I have loved recently include Grace and Frankie, Suits, Narcos and Shameless. Although now that all my vacations are over I don’t know how much TV watching I will actually be doing but hopefully at least some! Because sometimes losing yourself in a television show for 30-45 minutes is all the self care you need. And yes I do consider some television watching to be healthy. I would never advocate for daily TV show indulgences but I have heard other health experts advocate for strict TV avoidance which I think is crazy. In my books it’s all about balance. And if watching a little TV now and then brings you joy then by all means go for it! I need your advice on something friends. You see, I am working on a Paleo Breads and Baked Goods Cookbook and I want to know what you would like to see in there? Any recipes you are missing since you went paleo? If so let me know and I will make sure I will get them included! So far there are going to be three basic paleo bread recipes along with some crackers, biscuits and then some other amazing baked goods like cookies, scones, pies, cakes etc. It’s still in the early stages so if you have any ideas now is the time to let me know. Okay but on to this Whole30 Citrus, Cucumber and Cilantro Dip. One of the biggest complaints I get from people when they change to the paleo diet or Whole30 is not knowing what to eat for snacks. Well friends, dips make a great snack addition. Pair this one with raw veggies and you are good to go! You can also add it to meat or fish dishes or to cooked vegetables for a little bit more flavour. Because eating healthier should not be boring. At least not on my watch. This recipe comes together in just minutes and is not only safe for the Whole30 diet and paleo diet, but is also vegan, GAPS and SCD compliant. So go ahead and dig in! I have many other dips for you to choose from as well if you are interested, including Roasted Red Pepper and Parsnip Dip, Sweet Potato Nacho Dip, and Citrus Arugula Pesto. And if you haven’t yet, make sure you are signed up for my newsletter where I often send reader exclusive recipes, deals and giveaways. No spam ever. Promise.